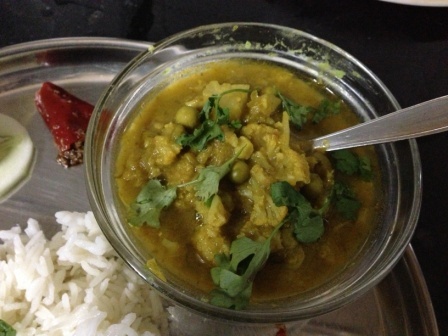 When my room-mate Rajni said matar ki dal I assumed it is a dish with green peas in some yellow dal. But this turned out to be a recipe I have never heard of. 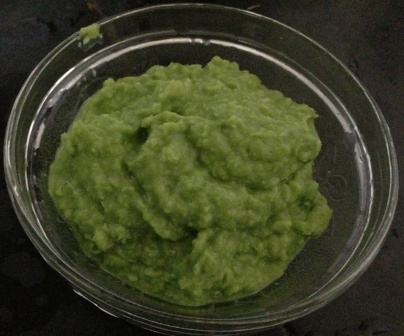 A dal made of green peas and cauliflower and no lentils. 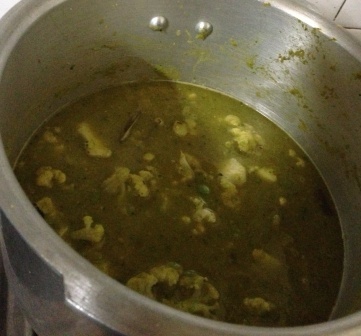 It is a recipe from Northern Uttar Pradesh(a region in Northern India). It tastes yummier than it sounds and very healthy too. And the recipe is very easy too. So I am posting it here for you guys to try and enjoy. 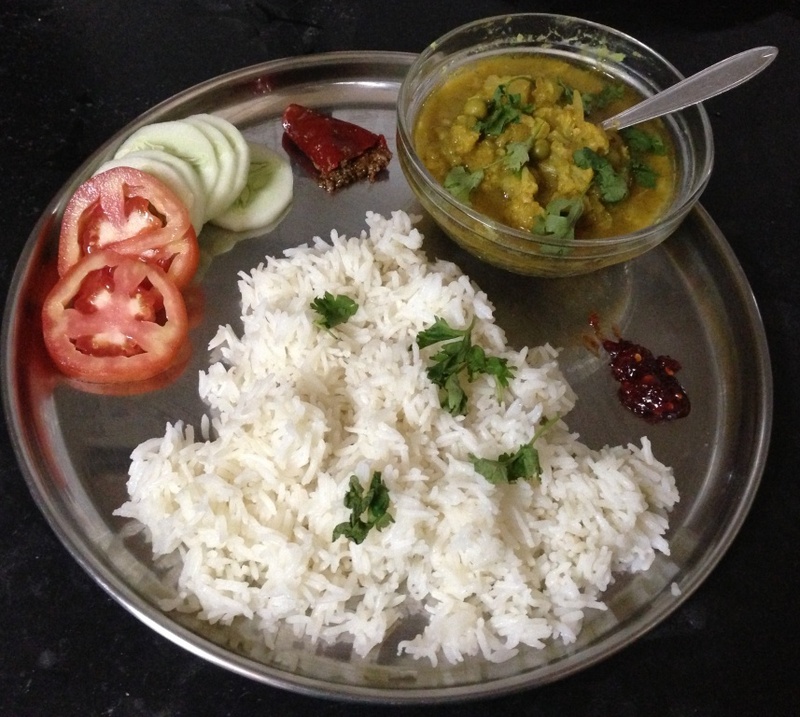 This dish is prepared by my roomie Rajni. I am just the photographer and the helper here. Blanch the peas and cauliflower. Set some peas aside and make the rest into a fine paste. Make a paste of other ingredients as well i.e. Onion, tomato, chillies, garlic, ginger, cilantro. 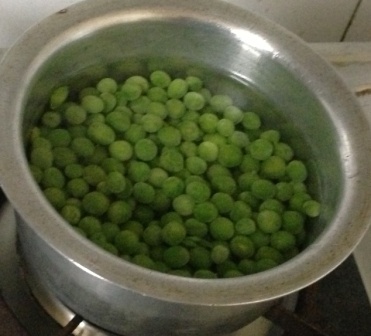 Boil the peas for 2-3 mins. 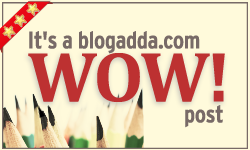 In a frying pan, heat mustard oil, add jeera and the garam masala i.e. cloves, bay leaf, cinnamon and black cardamom. Then add the onion paste and sauté for a minute or two. 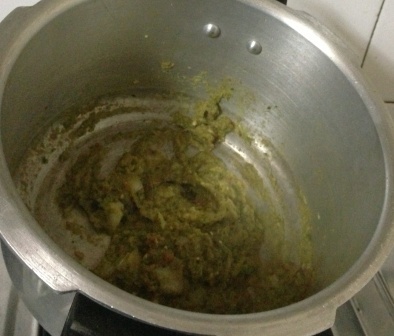 Add the green peas paste now and sauté for another minute. Now add the rest of the peas and the cauliflower and fry for some time. Add turmeric powder, salt, dry mango powder and any other dry masala that you’d like to add to this. Add water to this and close the cooker. Let it cook for about 3-4 whistles. Add peas and cauliflowers and fry. 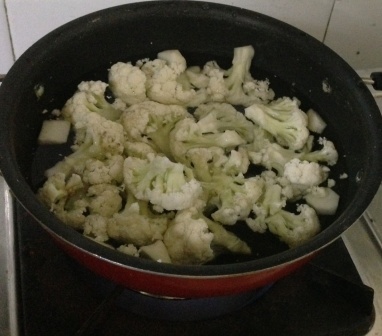 Then add desired amount of water. After the pressure is released, you have your hot dal ready to be served. 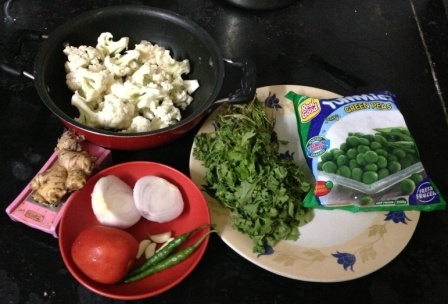 Garnish it with fresh coriander leaves and serve it with hot rice. I hope you like trying this recipe and eating it as much as we did. I can’t wait to try this! I love the rich complex flavors of Indian food. thank you for sharing this. Thanks for stopping by Kell. Mah all time favorite dish. Love it! I just tried this recipe and it’s just WOW! thanks for this delicious recipe.